This was another project in which I learnt a lot of great skills. Firstly, grading a pattern. For the first time ever I now have adjusted pattern pieces tailored to my size. It took a couple of goes and some help from my french curve (and a lovely gin and tonic) but I got it done! The second thing was well matched stripes at the sides and the top. For the life of me I couldn’t get the sleeves to match quite right but I gave them a valiant effort as well. I mean, look at these side seams. Oh wait! There’s not any evident because I matched them like a boss! Kazam! Now let’s talk twin needle stitching. This has been a problem in the past (see: PJ top of hot messness) and I was feeling the pressure when taking this on. Enter: two hours of playing around with stitch settings, length settings and tension adjustments which wielded some unexpected results! Check this out! In the end I went with the elongated wave setting and I love the finished look! Easy to follow directions. There were lovely clear pictures which is always helpful for a learning lady like me. The bands on the cuffs and waist- this is a great way for beginner stretch sewists to start working with this style of fabric. The variety of necklines and arm lengths. With this version I used the Version A neckline combined with the Version B sleeves. There was no stress in swapping these in. 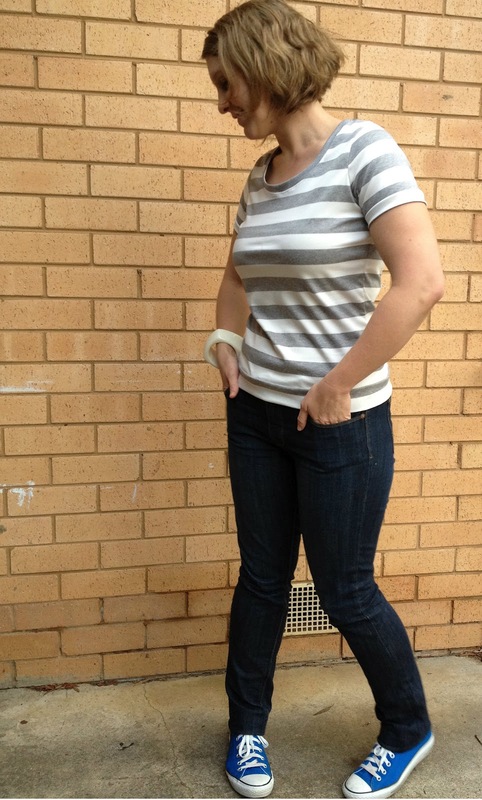 If I do stripes, coordinate neckline colour with cuffs and waistband. It looks great the way it is but my inner (okay, outer) neat freak likes it when everything matches. Version C- I want me some longer sleeves and a cowl neckline! Nothing significant requires change- after I graded the waist in to reflect how I like my tees to fit everything else worked well. I also avoided a FBA as there was sufficient ease in the bust to get a fit I liked. And finally, I thought I would show you how my Awesome Cape is travelling in the real world. 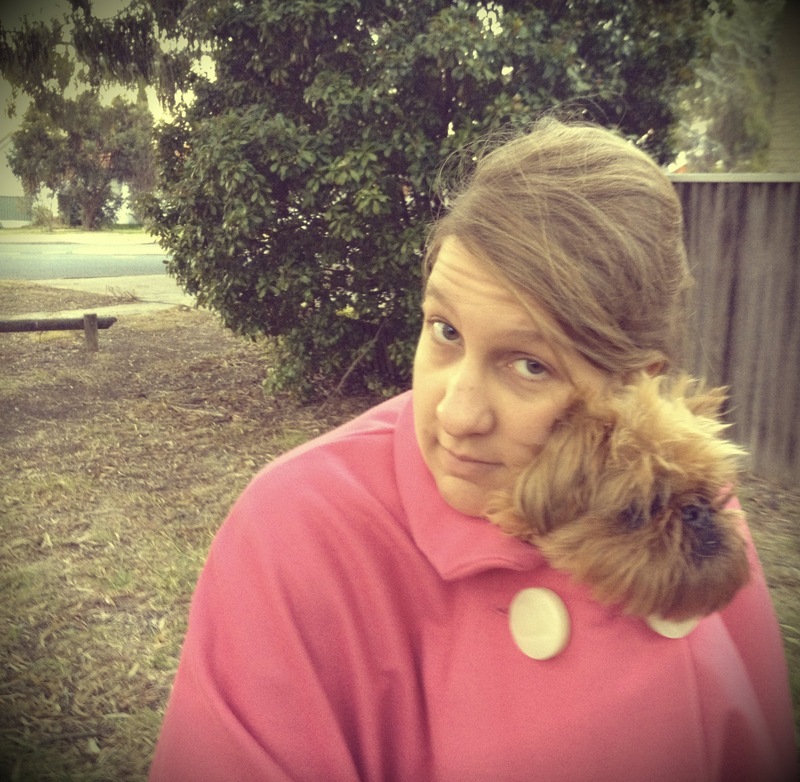 On a recent walk through the park, poor Pimble got a huge fright and ended jumping up into my arms under my cape. She wiggled her way up until her head was poking out and she could be on sentry duty. Fabulous! I love me some jersey tops (I may have lost count of how many I’ve made now). And good on you for doing the twin needle thing – I have one of those sitting in a drawer making me feel guilty that I haven’t tried it yet. I’m sure this will be the start of an epic journey with such a versatile pattern. That is one NICE looking tee, lady! (I’m wearing grey and white stripes as I type, but this tee is store bought, and even with alterations by me it’s been relegated to pjs!) Out of curiousity, how is the Japanese knit different from a regular knit? Stitchy- the twin needles and I have had words before and it was all “You don’t have mad enough skills to use me!” and I was all “Bring it, Twinny. I have youtube and google!” and after many, many mistakes I have found settings I like. You can conquer your twin needles nemesis! Gillian, thanks you! I am so involve with this top I may be wearing it right now 😀 In regards to the different between the fabrics, I’m not sure of the specifics (and there may be none but a marketing tag and a placebo effect) but this feels very different to the other cotton jerseys and wool knits in my collection. It feels more structured than both the cotton and the wool but it still is very breathable, flexible and has a nice drape. I even made husband have a feel and he was rather impressed. Lauren- do eeet! You will not regret! Now that I know how to make my own tees things are going to be getting crazy (for me) and repetetive (for you peeps). I should link the picture of my recently culled wardrobe- I have 37 tees colour coordinated hanging up. Tee pride! 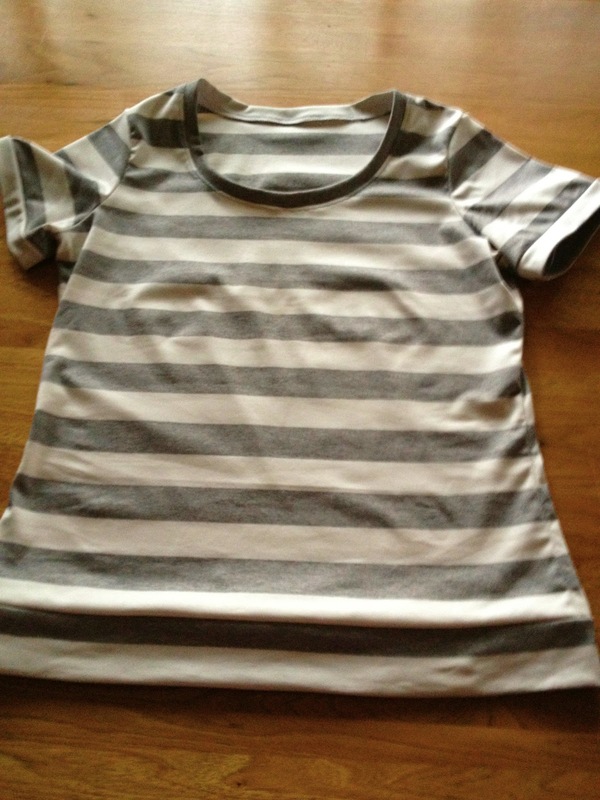 I am a fellow stripe-challenged stitcher as well. You did a great job! I love seeing everyone’s Renfrews, I have this pattern and I’ve been meaning to get to it. Tee and jeans gals of the world unite! Lucinda- go for broke with this one! 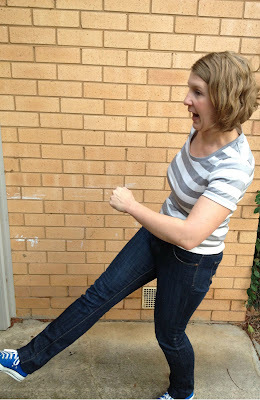 It is a jeans and tee gal’s staple (or at least I think it will be!) You can defeat the stripe! Awesome top Amanda. Cake sewing can be a tad ho hum but so worth it in the end. Thanks! I am coming round for the nee do cake sew- my next project is a work dress. I’m hoping to sass it up where I can! That is one hot AWESOME top!! You did an amazing job on it! I only wish I had half your patience!! Good work!! (I am sure the gin and tonic helps, I shall have to try that as a sewing aid!) Cheers! Thanks, Symon! I am rather enamoured with it. I say take on your twin needles with a Tim Tam in hand. You can do it!!! LOVE the shirt! Man, seriously, I need to start paying you to be my personal tailor. Either that or I’m totes raiding your closet next time I visit.